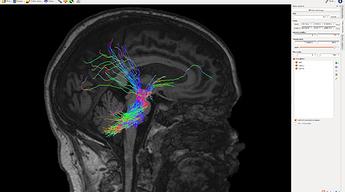 Anatomically-Constrained Tractography (ACT) has been performed to generate fiber tracts. We extracted 2M fibers and then filter to .5M with SIFT for half of our data, and then for the other half, we extract .5M with no filtering. 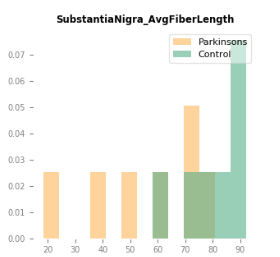 We want to compare structure and fiber loss between subjects and also tensor measurements ( eg: “fa”,"vector" values using tensor2metric, and “MO” value using FDT, a tensor image generation tool ) on those fibers. a) Is this procedure acceptable? What are the challenges analyzing loss of fibers when we always choose a fixed number? b) Can we make conclusions from comparison? Or what else should be in our consideration? It’s not clear to me the purpose of combining a tractogram on which SIFT has been applied with one where it has not. If these are literally concatenated and then processed as a single dataset, then you do not have the quantitative benefits that SIFT provides. If you are quantitatively assessing streamline count post-SIFT, with a fixed number of streamlines in the whole-brain tractogram for each subject, then essentially what you are actually quantifying is “the fraction of total white matter fibres in the brain that correspond to the pathway of interest”. This is the concept of connection density normalisation that I repeatedly talk about on this forum but still haven’t submitted the manuscript that explains it; hopefully that will provide further clarification in the future. The distribution of average streamline length is interesting, it just needs to be very clearly described as such, in that it is a length of reconstructed streamlines, and not a density of white matter fibres or an actual biological fibre length. The -vector option in tensor2metric provides the first eigenvector, which is a direction and not a quantitative value. So it’s not clear exactly what’s being shown in your final plot, but I would advise double-checking that you are in fact extracting / plotting what you intended. Appreciate the response and thank you for helping clear the concept of connection density normalization. I further generated fiber tracts in the disease group and healthy group with SIFT and non-SIFT, respectively. 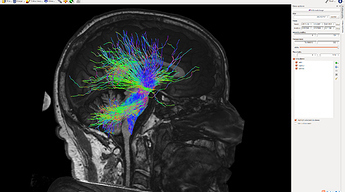 SIFT or not SIFT, nigrostriatal fiber loss can be seen obviously when comparing the two group subjects. With such consistent results, is it reasonable to say the fiber tracking results could be acceptable even without the quantitative benefits that SIFT provides in this case? Cause I’m considering to produce more data with such a procedure and without SIFT may be faster. First, tensor2metric -vector vectimage.nii.gz has been applied for generating the principal vector images, rather than all three components. Second, tcksample was used to extract the direction information from the principal vectors, with vectimage.nii.gz as input images and the output scatter values. I guess it may help identify axial and radial diffusivities. Or, maybe I did something wrong here. Fixel images may better describe directions, I didn’t test it though. With such consistent results, is it reasonable to say the fiber tracking results could be acceptable even without the quantitative benefits that SIFT provides in this case? Depends on what you mean by “acceptable”. Even if you would be able to obtain a “difference” (whether subjectively obvious or statistically significant) without the use of SIFT, you would still have the limitations in both interpretation and likelihood of journal reviewer approval that come with counting streamlines. There’s also the higher-level scientific question of whether you’re looking at data both with and without SIFT and choosing which to present, which, unless you are using these data to inform a subsequent study, brings with it the issues of cherry-picking / multiple comparisons. Cause I’m considering to produce more data with such a procedure and without SIFT may be faster. Be aware that by default, tensor2metric -vector will generate an image that is modulated by FA, ie. are not unit vectors that represent orientation information only. You can disable this using the -modulate option. 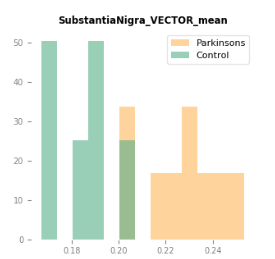 Second, tcksample was used to extract the direction information from the principal vectors, with vectimage.nii.gz as input images and the output scatter values. The tensor glyphs could be near-identical between the two subjects, but for whatever numerical reason, the direction of the first eigenvector is precisely reversed in the second subject with respect to the first. The estimated direction of the underlying fibres is the same due to the antipodal symmetry of the diffusion signal; yet in your analysis framework, the underlying image values could not be any more different. Imagine two subjects that position themselves in the scanner at considerably different angles to one another, such that the alignment of the anatomical bundle relative to the scanner axes differs substantially. If, during transformation of their image data to template space, you did not appropriately realign the underlying orientation information (whether diffusion gradient table, diffusion tensors, eigenvector orientations, …), then again, the underlying image values containing the X, Y, Z components of the first eigenvector relative to the scanner axes will differ substantially even if the two subjects are identical. Sampling these image intensities via tcksample does not mitigate either of these issues. Even if not using image transformation / registration, the fact that the subject anatomy may be aligned to the scanner axes differently between subjects must be appropriately taken into account; as must the antipodal symmetry of fibre orientations. I guess it may help identify axial and radial diffusivities. Why not just extract the axial and radial diffusivities? Fixel images may better describe directions, I didn’t test it though. Fixel orientations are encoded as XYZ triplets relative to the image axes, just as the first eigenvector via tensor2metric -vector is. While the former enables the representation of more than one fibre orientation in each voxel, the issues described above still apply. All of the above is not to say that it is not possible to perform some kind of comparison across subjects in terms of fibre orientation; only that to do so would require tailored analysis methods to do so robustly.